Disney never disappoints. Following the Iron Man 3, Monsters University and Frozen, another blockbuster hit joins in the 2014 Disney movie list this summer-Maleficent. When it comes to Disney films, one can not help thinking of the one-love-fits-all stories where a prince or a princess meets some good person and survive the evil and live a happy life. This movie, based on the tale Sleeping Beauty, however, does not follow this standard predictable patten and reinvents itself in a classic way. If you are a movie addict, you are definitely going to buy a DVD of this movie. 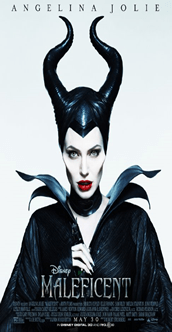 This article is going to offer you an easy solution to rip DVD Maleficent for mobile watching. Tips: The sad news is the Amazon blocks the Disney DVD sales or others. If you tend to buy its DVD version, Disney suggests you to get the physical movie from Walmart and Best Buy. Adapted from Sleeping Beauty, Maleficent has similar story. However, the former soundly panned out by depicting both beautiful and gloomy sides while the latter tells in the dark, raw view. It offers audience a stunning visual feasts and gutsy, imaginative piece of art with superlative screen writing, amazing casting, astounding production design, awesome lighting design, great acting and directing. It goes without saying that the movie is going to be another not-to-be-missed movie for collection for both Angelina Jolie's fans and Disney fans. However, in too many cases that you may find it's far from being enough just to put DVD Maleficent into the cabinet. As a DVD movie collector, you know how hard it is to protect those fragile DVD that is more than 10 US dollars from scratches, damages, cracks, etc, which can bring quick end to your DVDs. Not to mention the limits and impossibility to play DVD on portable devices such as iPhone, iPad, iPad Air, Android etc. Finally, you may have come up with the idea of copying and ripping DVD Maleficent. Through lots of DVD rippers are available in the market, an improper DVD ripper can mean a waste of money. To choose the qualified one, an important factor should be paid attention to. Distributed by Disney, DVD Maleficent is protected by Disney copy protection. Disney copy protection, together with many other copy protections like DVD CSS, region code, RCE, Sony ArccOS, UOPs etc, presents the biggest challenge for most DVD rippers. Which DVD ripper is capable to rip the Disney DVD disc? Don't worry, here MacX DVD Ripper Pro helps. This DVD ripper is capable to rip any DVDs protected by the above mentioned Disney, region code, RCE, DVD CSS, Sony ArccOS, UOPs, etc. In addition, it can convert DVD directly to MP4, FLV, AVI, WMV, MOV, MPEG, QT etc so as to play DVD on iPad, iPhone, Android and other mobile devices. Download either DVD ripper for Mac or DVD ripper for Windows based on your OS. Follow the following simple steps to rip DVD in minutes. 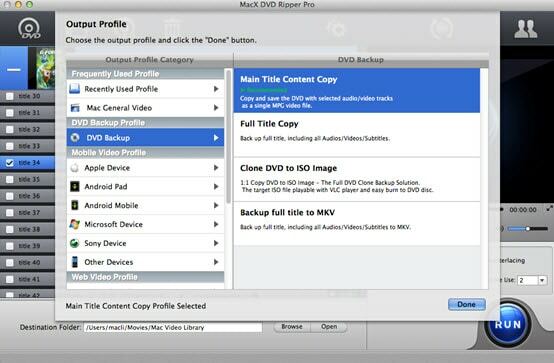 Launch MacX DVD Ripper Pro and Click "DVD" to load the DVD Maleficent. Choose the output format. If you want to backup DVD Maleficent for better storage, you can just choose one of the four modes in the "DVD Backup" category and it can copy your DVD to MPEG-2, MKV, ISO image with 1:1 image quality. To convert DVD directly to mobile devices such as iPhone, iPad Air, iPad Mini, Samsung Galaxy S5, Galaxy Note 3, HTC One M8, Surface Pro 3, PS4, etc to enjoy on the go, just choose the respective device profile from the list. Click the "Browse" button to set the file to save the output video file. Click "RUN" button to rip DVD Maleficent on Mac OS now. The whole process is 36x faster with no quality loss. Tips: Do you still remember the theme song of Frozen Let It Go? I bet you do. The theme song of Maleficent is not a halfpenny the worse. For those who want to enjoy those melodious songs on iPhone 5S/ iPad or MP3 players, this DVD ripper can easily satisfy your needs with its audio extracting ability.